Very little was saved and very few people were allowed back in to collect what was inside. Usually there would be a day given when people could return and collect what was inside, but this day won’t come because at 6am bulldozers arrived and began the demolition at 8am. Amongst the rubble of the old Moorfield Primary School, you’ll find children’s clothes and toys, as well as passports and medication of Occupy London protesters who had been working with the local community to use the building to house workshops focusing on social, economic, environmental and cultural issues. Only last week the local community asked the council to buy back the school and keep it as either a primary school or community space. Occupy London condemns the demolition of the building without regard to the needs of the community. 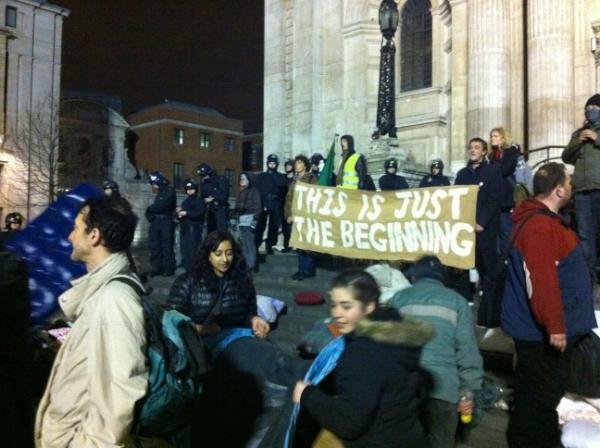 You can’t evict an idea – and so just as Occupy continues beyond the St Paul’s site, so too does The Occupied Times. The first issue of the publication to be printed following the clearance of the St Paul’s camp rolls off the press this Thursday, with all the usual news, comment and features – as well as some special content to highlight the achievements of the movement to date and give an insight into plans for the future. Issue eleven will pay tribute to the origins of Occupy London and the camp atSt Paul’s with a centre-fold photo collage and a timeline infographic mapping notable events since the movement emerged last year as part of a concerted, global response to social, economic and environmental injustice. OT #11 will also include a section dedicated to the issue of homelessness, including interviews with homeless people who have been staying at Occupy camps and features looking at how the state is failing homeless people and how we can address the issue. News will focus on the recent clearance of theSt Paul’s camp; which, at the time of eviction this week, was the world’s longest-standing Occupy site. The issue will also feature headlines on the eviction of the School of Ideas, the ongoing Finsbury Square eco project and the recent School of Rockupy initiative – which saw Occupation Records work with musicians Kate Nash and Sam Duckworth to make music with schoolchildren from across the capital. The finance pages will see the return of Money Talks, featuring Greek economist Yanis Varoufakis, as well as articles on the Jubilee Debt and Move Your Money campaigns. Featured in the international section are pieces on the trouble inSyria and Greece and the second wave of Egypt’s stuttering revolution. Other articles of note in this issue are a piece on ‘future people’ by Green Party politician and academic, Rupert Read, and a forward-thinking piece by American sociologist, novelist and political writer, Todd Gitlin on ‘Occupy After the Camps’. Distribution of OT #11 will compliment the wider outreach drive of the Occupy movement. Marking a first for the paper, distribution will extend beyond the City and into our communities, with a number of independent businesses across the capital participating to stock copies. You will find copies of The Occupied Times at locations including Come The Revolution Cafe, Cafe Crema, Sister Ray, Rough Trade, Freedom Bookshop, London Review Bookshop, Black Gull Books and Housemans – Radical Booksellers. As Occupy moves beyond its origin at the London Stock Exchange, The Occupied Times is also gearing to the future. Plans are underway for further development of the non-profit, ad-free publication and its digital front; to support the causes of Occupy and to offer a credible media outlet for the voices of the 99%. To make these plans a reality, the publication is launching a funding drive with Sponsume for readers and supporters to help keep the printers rolling with any donations they may be able to spare. Police and bailiffs have moved in to begin clearing the Occupy London encampment outside St Paul’s Cathedral, after a high court decision gave the green light for the City of London to clear the protest site. Activists were told by bailiffs that they had five minutes to pack their tents and leave or they would be obstructing a court order. The eviction began shortly after midnight. Dozens of activists appeared ready to comply and started clearing away tents and other belongings, but a number of protesters immediately began building an improvised barricaded enclosure using wooden pallets and pieces of debris. Hundreds of police officers in the immediate area of the square had riot helmets ready by their sides, and smaller detachments of riot officers carrying shields stood ready to one side. Dozens of bailiffs in yellow vests waited alongside rubbish lorries, and police in blue overalls, who had riot helmets strapped to their sides, stood by and watched as many of the protesters started taking down their shelters. One group, however, appeared ready to resist any attempts to remove them as police set up a cordon between the camp and the entrance to the cathedral. At midnight, five spotlights illuminated the square and the protesters as the standoff continued. City of London and Metropolitan police cleared and then blocked roads around the square where protesters have been camping since late last year as part of a protest against the financial and banking elite. Inside the small enclosure, which a number of activists had built up, one man let off a red smoke flare while nearby a speaker system pumped out music. One protester, Ed Greens from north London, said he had been with Occupy since last year. “We were expecting them on Monday night or soon after,” he said. “Some people will resist things like this, but for me personally there is nothing wrong with self-defence.” Among those at the scene were Symon Hill, associate director of the Ekklesia thinktank, who said that the word had gone out for dozens of Christians to come to the scene as part of plans to put in place “a ring of prayer” in an attempt to halt any violence. Catherine Brogan, a poet and high-profile member of the Occupy movement, said it made sense for the authorities to come on a Monday night. “There was talk of prayer rings and of other people coming down to support us when this happened, but many of our supporters are elderly or obviously live in areas other than the centre of London, so this would have caught them by surprise,” she said. “This has always been a peaceful process, and it has never looked like turning into anything other than that,” she added. “There’s definitely no Molotov cocktails stashed, it is very timid. I just hope the police respect that, and don’t react in the way I’ve seen them reacting at other times, at other protests.” Activists from the camp say they will take their case to the European court of human rights, but judges denied them a stay of eviction, and it is understood that the City of London Corporation, which brought the case against the protest camp, has has now acted to remove up to 100 tents from the grounds of the cathedral. A City of London statement said last night: “We regret that it has come to this, but the high court judgment speaks for itself, and the court of appeal has confirmed that judgment. High court enforcement officers employed by the City of London Corporation are undertaking the removal with the police present to ensure public safety and maintain order. We would ask protesters to move on peaceably. Police and bailiffs have evicted anti-capitalist protesters and removed tents from the Occupy London camp at St Paul’s Cathedral. The operation, which began just after midnight, was mostly peaceful but there were 20 arrests. A St Paul’s spokesman said: “We regret the camp had to be removed by bailiffs.” The City of London Corporation said it “regretted” that it had become necessary to evict the protesters. Occupy London, which campaigns against corporate greed, set up the camp on 15 October. The campaigners were refused permission to appeal against a High Court decision to allow their eviction to proceed. Protesters in the square outside the cathedral stressed their action was far from over, but most did not resist police and bailiffs as they removed tents and other equipment from the site. 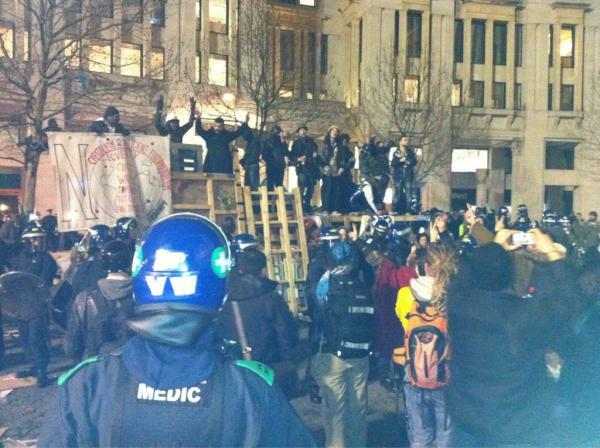 A handful defied police by erecting a temporary structure from wooden pallets in the square outside St Paul’s but the platform was eventually dismantled. The High Court decided last week that the City of London Corporation’s move to evict the camp was “lawful and justified”. The corporation was granted orders of possession and injunctions by the court. The Court of Appeal’s decision not to allow an appeal meant the corporation was free to clear the site. The anti-capitalist tent encampment, which has been in in the shadows of the Cathedral since last October, was dismantled in a largely peaceful night-time operation by around 100 officer and bailiffs. It came after the movement – a response to corporate greed in the financial industry – lost its application at the Court of Appeal to challenge orders to leave the area following a lengthy legal dispute. Bailiffs arrived just after midnight and dismantled wooden structures and loaded tents, placards and banners into rubbish lorries. Around 20 people were arrested. There was a moment of tension when a man later identified as Jonathan Bartley was cleared from the steps of St Paul’s while praying but protesters said they were most dismayed at the perceived betrayal by the church. Kai Wargalla, a 27-year-old student from Germany who has been camping at St Paul’s since the occupation began, said: “We hadn’t expected to be evicted from the cathedral steps because previously the church has said it would give us sanctuary when there’s a violent eviction. “There was also some really unnecessary tension and stress caused by the police when they told us we had five minutes to take our things from the camp.” She added: “It’s really sad what’s happening today but I think we can be proud of what we’ve achieved. Our community is being attacked here, but we’re going to reconvene and come back stronger.” She said many of the campers from St Paul’s planned to go to one of the group’s other sites in Finsbury Square instead, and extra tents would be put up following the unexpected eviction from the School of Ideas from a disused school building in Islington, north London. Dr Giles Fraser, the former canon chancellor at St Paul’s who resigned in the wake of the occupation, said it was a “sad day” for the church. 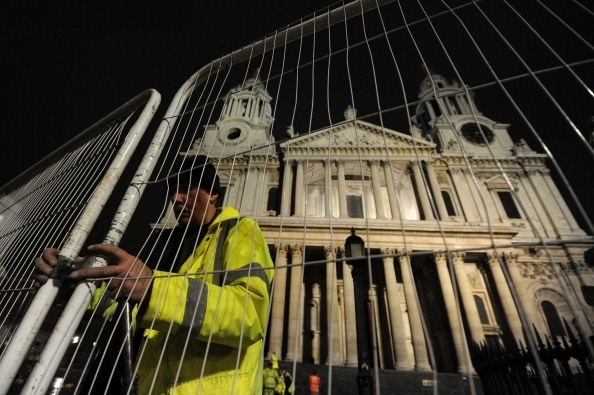 “Riot police clearing the steps of St Paul’s Cathedral was a terrible sight,” he said. He also tweeted: “Really proud of the way Occupy conducted themselves last night.” Occupy London spokesman George Barda, 36, maintained the decision by the court to allow the eviction was unjust, saying: “But the main thing was that it remained peaceful. We said publicly many times that this is a non-violent movement and it did remain peaceful. “There were some arrests but only for resisting arrest and the main thing to focus on is the reasons we are here and not the drama of what happened last night. “Millions of people are already suffering from the cuts and they have barely got going.” He insisted the eviction did not spell the end of the protest. “This morning, the City of London Corporation and St Paul’s Cathedral have dismantled a camp and displaced a small community, but they will not derail a movement. 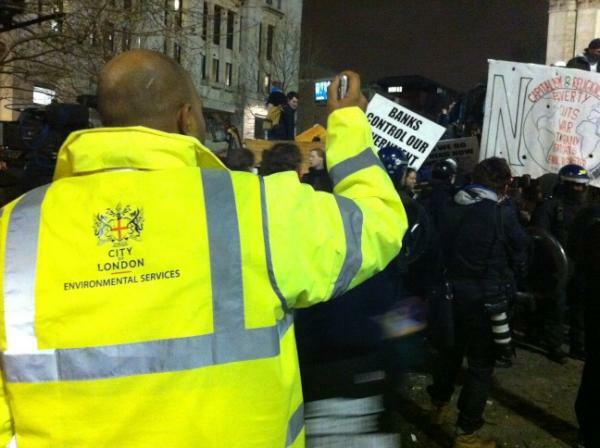 The attention given to the final hours of the Occupy London Stock Exchange site is testament to that. We would like to thank all those who got the word out on social and traditional media overnight. We are deeply appreciative of the sustained attention we have received; it’s all the more precious at absurd hours of the morning. LONDON — Police and bailiffs began dismantling Occupy London’s campsite outside St. Paul’s Cathedral late Monday, clearing one of the longest-surviving encampments inspired by the New York protest against capitalist excess. The protesters said vans loaded with police arrived at the site before midnight. The local authority, the City of London Corporation, confirmed the eviction was under way by bailiffs, backed by police. “We regret that it has come to this,” the corporation said in a statement, asking protesters to move on peacefully. Civic authorities have an eviction order allowing them to remove the activists’ tents, though not the protesters themselves. There appeared to be several dozen protesters at the site, down from hundreds at the height of the camp. As bailiffs in fluorescent jackets began to drag tents and their contents to waiting trucks and dumpsters, some protesters attempted to wear their tents as clothing and others used wooden pallets to form barricades. Police in riot gear formed lines nearby, but there were no immediate reports of arrests. Protesters inspired by New York’s Occupy Wall Street movement have been camped outside the 300-year-old church since October. They say they are exercising freedom of speech and drawing attention to a warped capitalist system that spawned a global financial crisis. Local authorities claim the camp has harmed nearby businesses, caused waste and hygiene problems, and attracted crime and disorder. Last week, a court rejected the protesters’ challenge to the eviction order, ruling that the right to protest did not justify a semi-permanent camp on a public pathway. The protesters set up camp outside the cathedral after they were prevented from camping in front of the nearby London Stock Exchange. Their proximity to Christopher Wren’s architectural icon embroiled the church in a conflict between bank-bashing protesters and the city’s finance industry. The church’s position on the protesters has shifted several times, and the cathedral’s dean and a senior priest both resigned over the crisis. These are 5 great paid Android games that you ought to don your phone. The new Android phones are phones that are powered by the Linux Kernel mobile operating System.